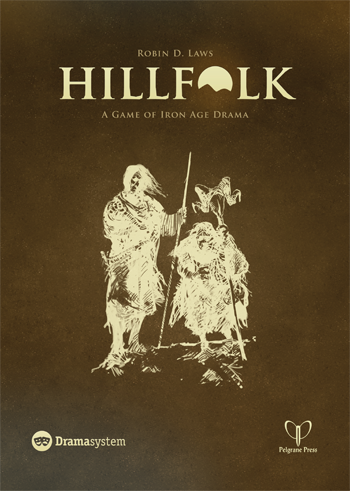 With the Hillfolk roleplaying game, 5-8 players weave an epic, ongoing Iron Age saga of high-stakes interpersonal conflict that grows richer with every session. The DramaSystem rules provide you with a simple storytelling framework that brings your creativity to the fore and keeps a surprising, emotionally compelling narrative constantly on the move. As you build your story, it molds and shapes Hillfolk into something unique. Do you entangle yourself with your wealthy cousins to the north? Do you battle the fearsome sea people to the west? Or do you conquer the scattered badlands tribes to forge a new empire of your own? The game also includes 30 more settings, where you can engage in witty banter and deadly duels in 18th century London; be part of the team that makes first contact with aliens; find romance and danger in the secret world of supernatural monsters; and much more. From backwoods Cthulhu cult family drama to ninjas, pirates, and a steampunk Old West, Hillfolk offers years of play value.